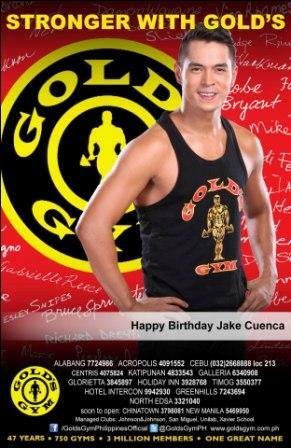 Gold's Gym Birthday Greeting Billboard to Jake Cuenca! Hunk actor Jake Cuenca is currently celebrating his 25TH Birthday. Gold's Gym where he is one of the male endorsers greets him via a billboard. Jake is currently seen in the Primetime Bida drama series "Kahit Puso'y Masugatan."